Whitewater Rafting in Tennessee - White Water Attraction near Gatlinburg TN - Pigeon Forge Rafting / Whitewater Rafting Tennessee / What is Whitewater? Whitewater rafting in the Smokies is a wild and wet adventure. With exhilarating rapids along the Upper and Lower Pigeon River, it is easy to see why whitewater rafting in the Smoky Mountain area is such a popular activity. Have you ever wondered what exactly ‘whitewater’ is? Whitewater refers to the bubbly, unstable current in a river. It is known as whitewater because the frothy water takes on a white appearance. Whitewater is formed in a rapid, which is a section of a river with fast moving water and turbulence. The term ‘whitewater’ can also refer to a river or creek which contains a lot of rapids. Where Does Whitewater Come From? Whitewater rapids are created by four different factors related to ‘streambed topography’, which refers to the physical layout of the river. One key factor is the river’s gradient, which refers to how to steep the river is. Steeper rivers have more powerful torrents. Rapids are also caused by constriction, which is when a river’s flow is forced into a narrower channel. Another factor is obstruction. Boulders or ledges in rivers can create swirling patches of water known as eddies. Finally, rapids are also determined by the rate at which a river flows. An increase or a decrease in flow can generate rapids or remove them from a river. 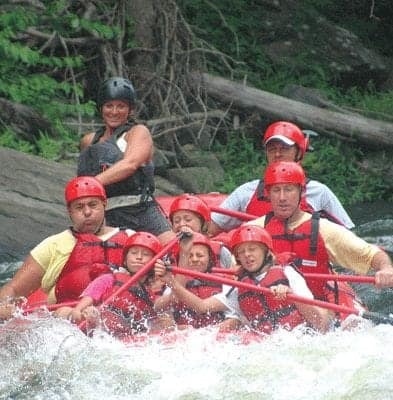 If you are ready to experience whitewater rapids for yourself, take a trip to Smoky Mountain Outdoors. The number one destination for rafting in the Smokies, Smoky Mountain Outdoors offers safe and exciting trips through some of the best whitewater rapids in the Southeast. Visit our FAQ page to find out more about this fantastic Gatlinburg attraction!